3. Minutes of the previous Meeting held on 14th July 2011: The Minutes were unanimously approved. The grit bin at the corner of Blo Norton Road has been installed and filled. There is a contact telephone number inside the lid for refilling. The display of art work in the phone kiosk has been a success and the next proposed use is for a book exchange. RW is to speak to Pat Blanchet and to Steve Morley with regard to installing some suitable shelving. The pavement by the War Memorial has been resurfaced and potholes on Redgrave Road have been repaired. The Church notice board has been completed and is in situ. It was agreed that it looks splendid. Mrs Evelyn Logsdail wrote to the Parish Council stating that she thought it a good idea to place a small brass plate on the board with information about the funding provided by the bequest from Miss Bernice Malsom, Lord of the Manor. Mrs Logsdail is looking into the cost of such a plate and the Parish Council will use remaining funds from the bequest for this purpose. The Council recorded its thanks to Mrs Logsdail for acting on its behalf in relation to the notice board. 5. (a) The proposed Memorial of Ralph E Bowell (World War II) was discussed and subject to speaking to the family, approval was given. (b) There was tabled and approved the Risk Assessment for the coming year relating to the activities of the Parish Council. (c) The Council agreed to increase its annual contribution to the cost of The Lophams’ News from £93.79 to £258.00 necessitated by the change of regime at the journal. 6. Financial Report The accounts were scrutinised and approved by SM before the Meeting. Current A/C £1,275.83 Savings A/C £1,769.50 Jubilee A/C £444.51 The following cheques were unanimously approved for payment: Clerk £240; HMRC £60; Venue hire £10; Mazars Audit Fee £60. Nigel Martin’s invoice for £806 (Church notice board) was presented and approved for payment once funds had been transferred from the savings account. A short discussion about the precept for next year took place in view of increased expenditure and a Budget will be produced at the next Meeting. Steve Reynolds attended the Meeting as he has kindly agreed to take on the running of the PC website. He said he was pleased to be making a contribution to the village and was keen to develop the website. Villagers are encouraged to contribute by contacting Steve at [email protected]. RW thanked Steve on behalf of the Parish Council. 7. Reports from Councillors Planning SM Mr I Beckford Ref No: 3/PL/2011/0774/F Refused. The dilapidated mobile home is still on site and SM will write to Breckland Council asking for it to be removed. It is proposed that the Settlement boundary for the village be removed next year from which it would seem that the submission from the Parish Council has been ignored. SM is to follow it up. Highways PC A report from PC was read out at the Meeting stating that Brick Kiln Lane’s hedges, verges and road surface needed attention. This has been reported. The bend between South and North Lopham has still had sitting water after the rain but it was felt that due to the high rainfall recently, the drain was coping as well as could be expected. Mike Cox would monitor in consultation with PC. The Meeting was informed that the posts near the War Memorial had again been knocked down by a heavy lorry. PC to take up with the Highway Department. With regard to the forthcoming litter pick, PC can produce posters to publicise the exercise. Despite the proposal by PC to plant more bulbs this autumn, it was generally felt by the other Councillors that there are sufficient for the time being. A discussion followed about resiting the village sign but the feeling of the Meeting was to leave it where it is, by the Church. Community Matters DH. It was reported that the Village Hall Committee were asking the Parish Council to sponsor the annual bonfire. The issue was discussed but no decision was made. The White Horse PH is now closed and up for sale. TF will take on supervision of the litter-pick which takes place at 10.30am on Sunday 30th October, meeting at the White Horse PH car park. A risk assessment will be available for all participants to view. Footpaths RW Nothing to report. 9. 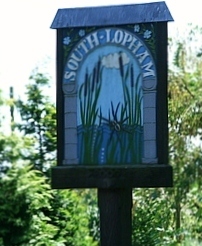 The Lophams’ Society The Queen’s Jubilee celebrations will take place on 2nd June 2012 and a number of representatives from various village organisations will collaborate through a committee to make this a successful event. The Society will hold its Autumn Quiz on October 15th from which a large portion of any profit will be paid to the Jubilee Committee. The Christmas drop-in will be on December 16th. 11. Items for next Agenda Precept budget. 12. Other matters (a) JP mentioned that there had been a number of accidents on the section of Redgrave Road near his home.. PC would be requested to investigate whether any steps could be taken to reduce the danger. (b) SM requested that the Parish Council write a letter of complaint about the excessive noise caused by a ‘rave’ or party on Sat/Sun 3rd/4th September in or about Fen Street. SM will give the Chairman the necessary information to draft such a letter. PDF version of the minutes (opens in new window).